If you want to use a new convertible to tow anything larger than a Jet Ski these days, your options are pretty much limited to a Jeep Wrangler. In the early 1970s, however, there were a number of beefy, open-air vehicles on the market, such as the Chevrolet Blazer, the Ford Bronco, the International Scout, the Toyota Land Cruiser, and, of course, the Wrangler’s predecessor, the CJ, which drove straight off WWII battlefields and has been for sale ever since. 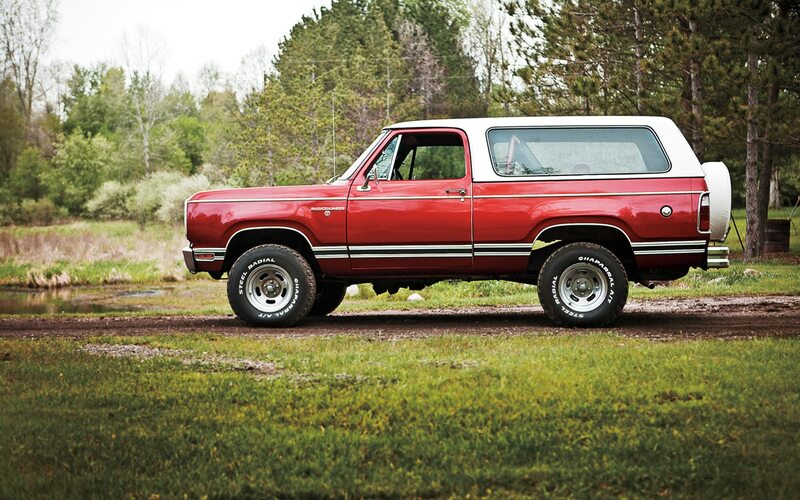 Nevertheless, Dodge built more than 13,000 Ramchargers in each of its first six model years. The new SUV gave outdoorsy Mopar fans exactly what they sought: rugged individuality. 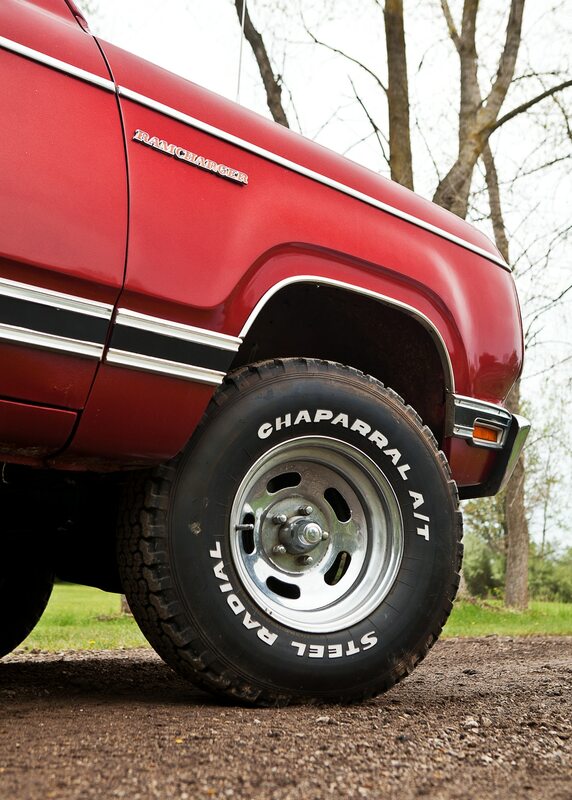 The Ramcharger was ostensibly a base-model Dodge pickup that had nine inches chopped from the wheelbase and with the bulkhead and roof lopped off the cab. The truck came standard without a roof, but the vast majority were fitted with a heavy, drop-on, optional steel top with a flip-up fiberglass rear window; a vinyl soft top was also offered. The bed area of the interior could be covered in rubber or carpet. 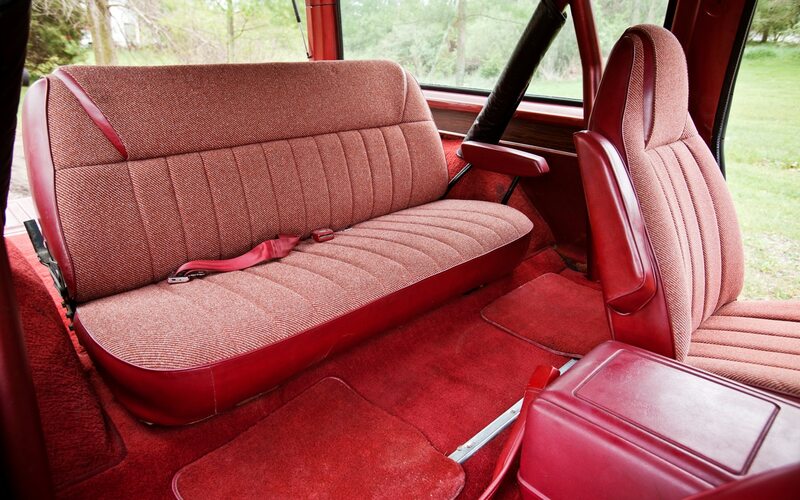 A rear bench seat was a popular option, but even the front passenger’s seat wasn’t standard equipment until 1976. Four Wheeler magazine drove a new Ramcharger from Detroit to Los Angeles in 1977 and particularly loved the segment-exclusive Styrofoam ice chest in the Dodge’s center console. “It may only hold a few cans or bottles, and a little cheese or bologna, but it is worth its weight in gold to a four wheeler!” Editors seemed fairly content with the Ramcharger’s fuel economy — they were able to coax as much as 11.5 mpg out of the 440-cubic-inch V-8 (the biggest of the five engine sizes offered in the Ramcharger), although an atrocious 8 mpg was more common in the mountains. as a car guy’s pack rat. The spry septuagenarian has dragged his wife, Dorothy, all over the country to collect old trucks, cars, and parts, and he’s scoured swap meets coast to coast for decades. For the past thirteen years, he has hosted a Mopar-focused car show in his sprawling front yard, and his Ramchargers always get prime parking spots. Pearson restored a couple of Corvettes long ago but really found his niche with Mopar trucks. His current primary project is a 1989 Dodge Dakota convertible that will get a stepside bed. His favorite drivers are another Dakota convertible and any of his nicer Dodge Li’l Red Express pickups (he has more of those than he has Ramchargers). Early Ramchargers were offered with big-blocks, but Pearson hated working on those engines at the Proving Grounds, so all but one of his vintage SUVs is powered by a Mopar small-block. His beautiful ’74 Trail Duster has tasteful, thin swathes of wood grain accenting its avocado metallic paint, and its 360-cubic-inch engine emits a classic V-8 burble. When you step on the long gas pedal, you can tell that the truck is powerful, but it never really feels fast. The big Plymouth is reasonably comfortable and composed at 55 mph — 60 mph, though, seems too fast on a windy morning because there’s so much slop in the steering and the wheelbase is so short. Four Wheeler editors in 1977 had far different sensitivities than we do thirty-five years later — they complimented the truck’s “precise and accurate” steering and said “handling was a breeze.” Still, the automatic transmission shifts quickly, the tight turning radius would be useful in off-road situations, and the brakes feel strong, which is reassuring when you’re driving a tall, short-wheelbase vehicle that weighs two tons. Driving a stepladder must feel like this. Even on a chilly morning with the top installed, it’s easy to understand how exhilarating it would be to drive one of these trucks to a remote beach, top off, cargo area full of picnic gear, seats full of friends. Front passengers enjoy the commanding seating position of an SUV, and the beveled hood stretching forward reminds occupants that they’re in something special. It’s a big truck, but rear passengers find their knees nearly touching their chins since the rear bench sits low to the floor; at least there’s an ashtray built into both rear armrests. 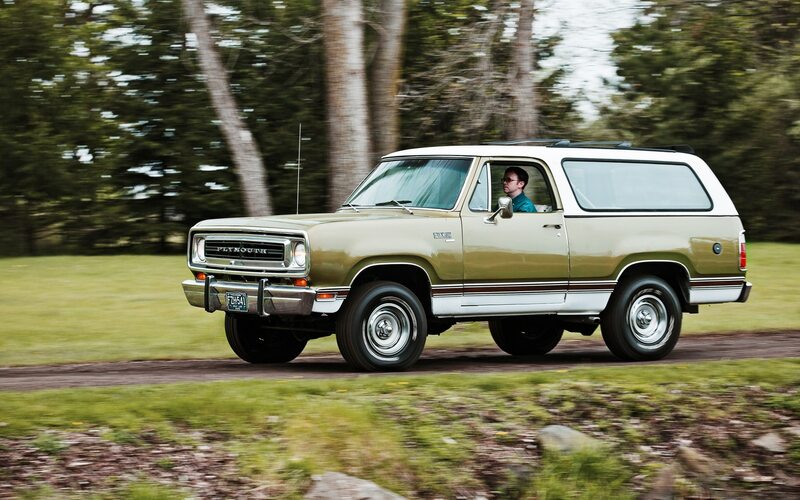 As smoking waned in popularity, so did large recreational SUVs like the Ramcharger. Dodge gradually and continually refined the model until its cancellation in 1993, but post-1980 Ramchargers were less charming, with fixed roofs and standard (previously optional) features such as radial tires, a thirty-five-gallon gas tank, and rear seats. Chrysler justified the death of the convertible Ramcharger by reporting that only two percent of owners ever removed their vehicle’s top. The Trail Duster was dropped after 1981. 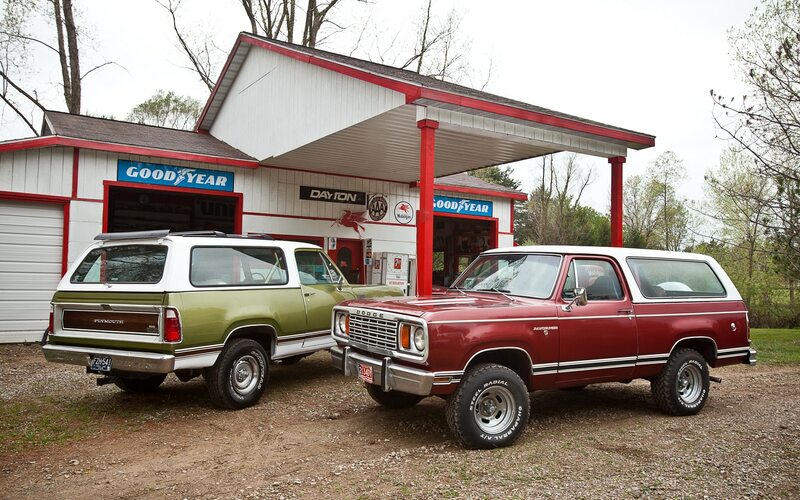 But when you consider the way most owners use classic cars today — on nice days and for fairly short distances — a Ramcharger actually makes a lot of sense. Plus, you can tow a vintage boat or camper in style with the wind in your hair. Why Buy? Because it’s cheap, versatile, and fun. 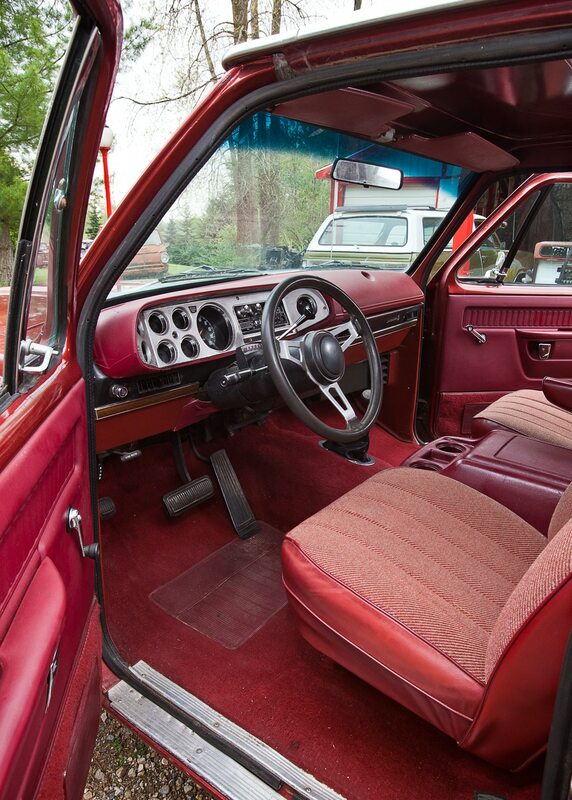 For the full convertible effect, try to find a 1974 model for its frameless front windows. Decals and stripes make examples with the 1978-1980 Macho package particularly cheesy/cool. Chrysler tried to improve abysmal fuel economy by lightening powertrain components in 1980, when a folding rear bench and power windows also appeared. Ramcharger culture is mostly that of hot-rodding and muddy four-wheeling (search “Dodge Ramcharger” on YouTube for proof), so many trucks have been modified. If you’re not into rodding or wheeling, know that nice vintage trucks of all makes and models have been gaining respect and value in recent years.